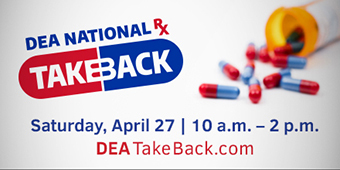 "DHP Encourages Health Practitioners to Advise Patients to Participate April 27, 2019 in DEA Drug Take Back Day--". An Open Letter from DHP Director, David Brown, D.C..
Healthcare practitioners are encouraged to advise patients about this service and to remind them it is free and anonymous with no questions asked. Collection activities will take place from 10:00 a.m. through 2:00 p.m. at sites coordinated with law enforcement agencies throughout Virginia. Healthcare professionals are encouraged to read a letter from DHP Director Dr. David Brown. You can use the DEA website to enter your zip code to find a local collection site. The Virginia Department of Health Professions (DHP) places the highest priority on the health, safety and well-being of the Commonwealth’s eight million citizens. DHP’s mission is to ensure safe and competent patient care by licensing health professionals, enforcing standards of practice, and providing information to healthcare practitioners and the public. The agency’s 13 health regulatory boards issue over 380,000 licenses across 62 professions. The agency’s Enforcement Division receives complaints and conducts investigations about alleged misconduct by healthcare practitioners and regulated facilities, and conducts inspections of facilities under the authority of DHP.